The radio will recognize only files with the *.MP3/WMA extension as MP3/WMA files. Non-MP3/WMA files named with the *.MP3/WMA extension may cause playback problems. The radio is designed to recognize the file as an invalid MP3/WMA and will not play the file. 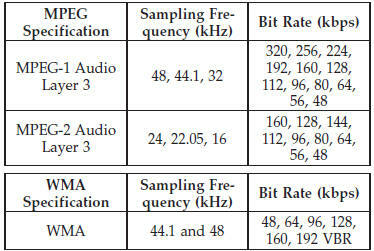 When using the MP3/WMA encoder to compress audio data to an MP3/WMA file, the bit rate and sampling frequencies in the following table are supported. In addition, variable bit rates (VBR) are also supported. The majority of MP3/WMAfiles use a 44.1 kHz sampling rate and a 192, 160, 128, 96 or VBR bit rates. ID3 Tag information for artist, song title, and album title are supported for ID3 version 1 tags. ID3 version 2 is not supported by the radios.